The phenomenal success of Mackie's line of mixers is no accident — it's the result of 40 years of experience producing and selling some of the world's most popular mixers and sound reinforcement equipment. 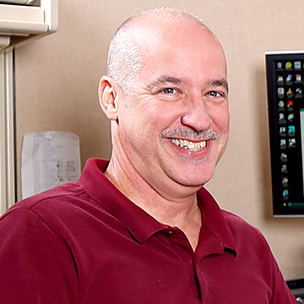 Now, Mackie's accumulated knowledge and experience is brought to fruition with their line of VLZ ("Very Low Noise") mixers. 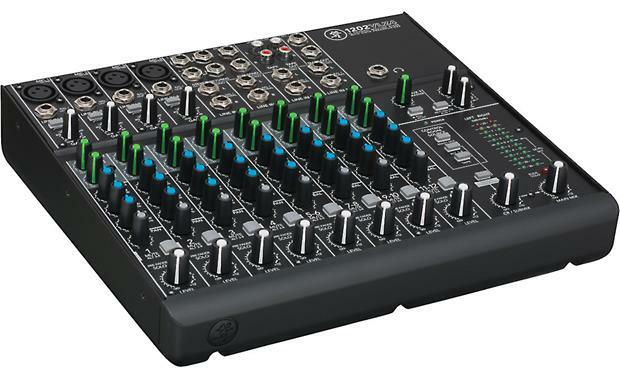 Mackie's 1202VLZ4 brings those results to you in a versatile, feature-rich rackmountable 12-channel mixer that's "built like a tank" with a rugged solid steel chassis. The mixer features four of Mackie's flagship Onyx microphone preamps, which offer the superior performance of a boutique mic preamp with the toughness needed to handle the pitfalls of life on the road. Each XLR input accepts balanced mic or line level signals and features phantom power for your condenser mics. 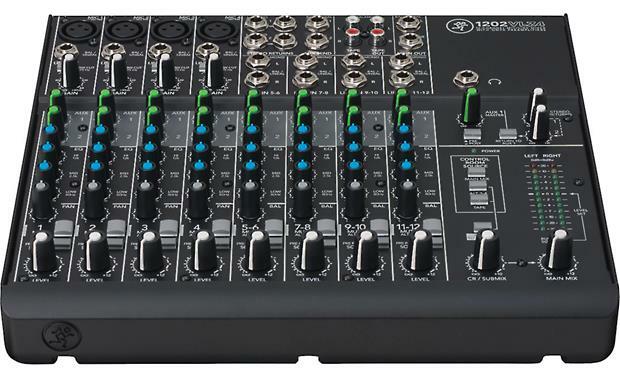 You'll be impressed by the exceptional headroom and low noise of this well-designed mixer. Line inputs 1-4 also utilize the Onyx preamps, and can be used to adjust the gain of lower-gain instruments such as older guitars. Channels 1-4 feature a 75 Hz low-cut filter on the microphone input channels to clean out rumble and other low-frequency noise. Channels 5 through 12 consist of paired stereo line inputs which accept stereo or mono signals(balanced or unbalanced) – these versatile inputs can handle the output from almost any instrument, effect, or playback unit. four balanced inserts for patching in outboard effects. You'll find 1/4" and XLR outputs for sending signals to amplifiers, powered speakers, or recording devices. 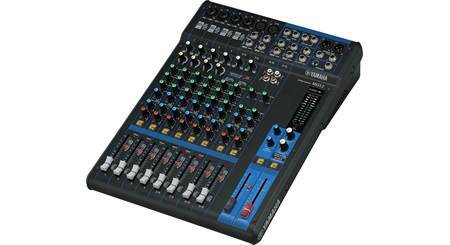 You can switch the Main XLR outputs to mic level so they'll plug into another mixer. The 1202VLZ4 also features dual-purpose mute/alt 3-4 switches on the channel strips that allow muting or routing the channels to the Alt 3/4 jacks on the back of the mixer, serving as a separate stereo bus. 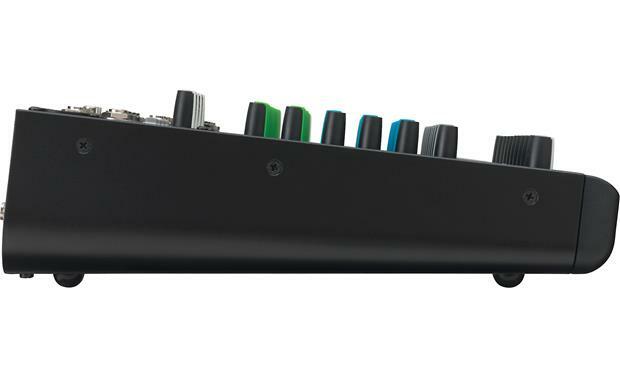 Each channel strip features buttons for Mute/Alt 3-4 and pre-fader solo listening as well as knobs for level, pan, three-band EQ, and Aux 1/Aux 2 sends. The output stage features the ability to submix the main mix, Alt 3-4 output, and the signal from the Tape inputs, then send the mixed signal to the main outputs. The Control Room/Submix knob acts as a separate volume control for the Control Room and headphone outputs.You can use the the Pre or Post switch to configure the Aux 1 knob as a monitor send or effects send. The Mackie 1202VLZ4's combination of sophisticated features and rugged construction makes it suitable for a wide variety of situations, ensuring that you'll be ready to control whatever the music sends your way. 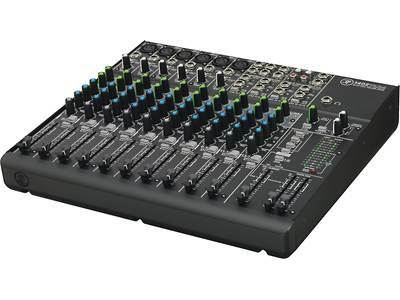 Line inputs 12 x 1/4"
12-Channel Mixer: The Mackie 1202VLZ4 is a 12-channel analog mixer featuring Mackie's signature high-headroom, low-noise design. Mic Inputs (Ch. 1-4): The 1202VLZ4 features 4 of Mackie's flagship Onyx mic preamps. 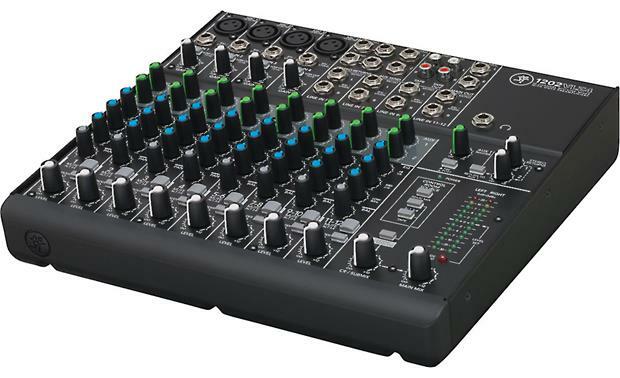 The mixer's channel 1-4 mic inputs consist of female XLR connectors. You can plug in almost any kind of mic that has a standard XLR mal mic connector. Professional ribbon, dynamic, and condenser mic will sound excellent through these inputs. 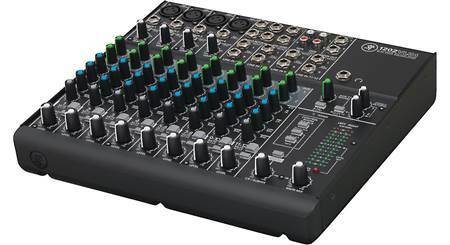 The 1202VLZ74's mic inputs will handle any kind of mic level without overloading. Most modern professional condenser mic are equipped for phantom power, which lets the mixer send low-current DC voltage to the mic's electronics through the same wires that carry audio. 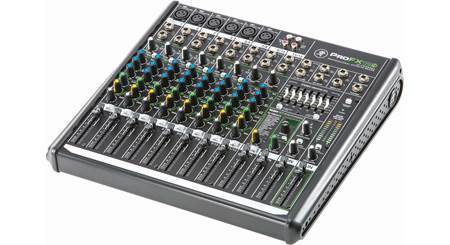 Phantom power for all mic channels (1-4) is turned on and off together. Line Ins (Ch. 1-4): The mixer's channel 1-4 line inputs consist of female 1/4" phone connectors. These input share circuitry (but not phantom power) with the 1-4 mic preamps, and can be driven by balanced or unbalance sources at almost any level. You can use these input for virtually any audio signal. To connect balance lines to these inputs, us a 1/4" TRS phone plug. to connect unbalanced lines to these inputs, use a 1/4" TS phone plus. These four line inputs are a good place to connect older instruments that need more gain. Stereo Line Ins (Ch. 5-12): These fully-balanced 1/4" inputs are designed for stereo or mono, balanced or unbalanced signal. They can be used with just about any professional or semi-pro instrument, effect, or CD player. Note: Channels 1-4 offer independent Gain control. 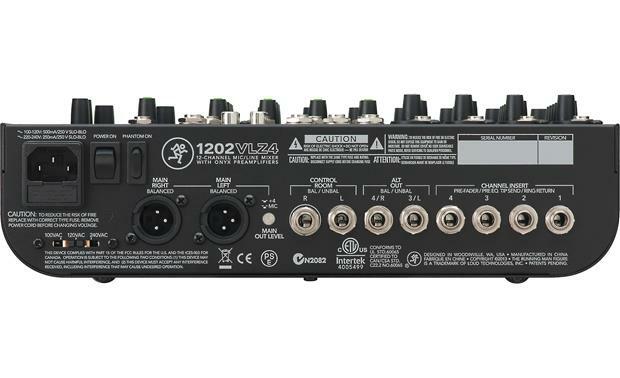 Main & Headphone Outputs: The 1202VLZ4 offers output jacks to connect your power amplifier, powered speakers, and headphones. 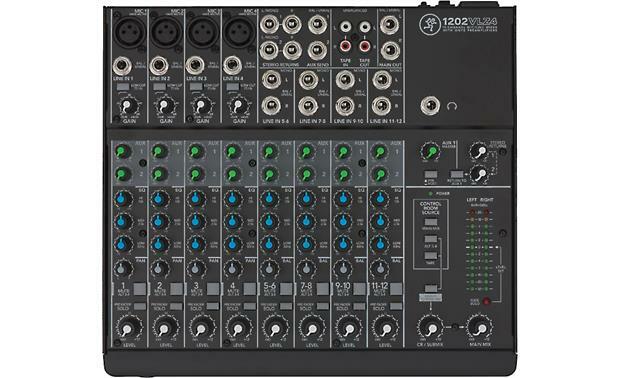 Main Outs: The mixer's main outputs consist of two balanced XLR connectors and two unbalanced 1/4" phone connectors. These outputs feed the main mix out to line-level inputs of your power amplifier, powered speakers, or another mixer. There is Main Mix level knob which control the level of signals sent to the main outputs. All channels that are not turned fully down will wind up in the main mix. Headphone Jack: This stereo 1/4" jack will drive any standard headphone to very loud levels. In the headphones, you will hear the main mix as well as any source playing the tape inputs. Adjusting the main mix level will not affect the headphone output; adjusting the tape level will affect the level of the tape input signal heard in the headphones. There is a Phones Level knob which allows you to adjust the level of the signal going to your headphones. Tape Input/Tape Output: The 1202VLZ4 offers both Tape inputs and Tape outputs. Tape In: These dual, unbalanced RCA inputs accept line-level stereo signals. The signals entering these inputs are always routed to the phones output, but can also be routed the main output. Use these jacks for convenient playback of your mixes. You'll be able to review a mix and then try another pass without repatching or disturbing the mixer levels. 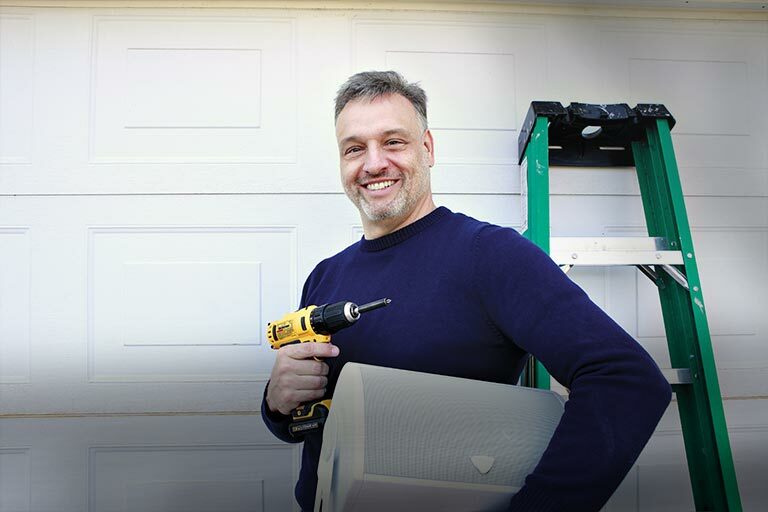 You can also use these jacks with an iPod, computer, or CD player. There is Tape Level knob which lets you adjust the level of the tape input playing in the main mix and headphones. Tape Out: These unbalanced RCA connections tap main mix output to make simultaneous recording and PA work more convenient. Connect these to your recorder's inputs. This output is an unbalanced copy of the main mix and it is affected by the main mix level. Other Inputs/Outputs: The 1202VLZ4 provides a variety of useful inputs and outputs. Aux Sends: The Aux Sends consist of two TRS 1/4" balanced/unbalanced outputs, commonly used to feed stage monitors or an external effects processor. The Aux Send knobs tap a portion of each channel's signal to provide an output here, allowing you to set up a nice stage monitor mix, or to setup an external effect from different channels. Stereo (ST) Return: The Stereo Return is where you connect the outputs of your parallel effect device. The ST Return can also be used as an extra pair of stereo line inputs. These 1/4" balanced inputs are similar to the mixer's stereo line inputs (only without EQ, aux sens, pan, mute, or solo functions). The circuits will handle stereo or mono, balanced or unbalanced signals. They can be used with just about any pro or semi-pro device. The signals coming into these inputs can be adjusted using the Stereo Return knob before passing the signal onto the main mix bus. ALT Out: The 1/4" outputs are the sum of any channels that have the mute/alt switch pressed. These output are 1/4" and may be connected to balanced or unbalanced lines. For example, you can use these outputs to feed a recorder and just record individual channels by pressing their mute/alt switch one at a time. Control Room (CR) Out: These TRS 1/4" balanced/unbalanced outputs allow you to listen to something other than the main mix. These outputs are often used to run a nice pair of powered studio monitors in a control room. Channel Inserts: These Channel 1-4 Inserts (1/4" phone jacks) are where you connect serial effects such as compressors, equalizers, de-essers, or filters. 3-Band EQ: The 1202VLZ4 has 3-band equalization at carefully selected points; low shelving at 80Hz, mid shelving at 2.5kHz, and high shelving at 12kHz. "Shelving" means that the circuitry boosts or cuts all frequencies past the specified frequency. High EQ: This control gives you up to 15dB boost or cut above 12kHz and it is also flat at the center. Mid EQ: This control gives you up to 15dB boost or cut below 2.5kHz; the circuit is flat at the center position. Low EQ: This control gives you up to 15dB boost or cut below 80Hz; the circuit is flat at the center position. Helpful Controls: The 1202VLZ4 is equipped with a variety of useful control dials, buttons, and switches. Pan: The Pan knob adjust the amount of channel signal sent to the left versus the right outputs. On mono channels (1-4 or 5-12 with connections to the L input only), these control act as pan pots. On stereo channels (5-12) with stereo connections to L & L inputs, the pan knob works like the balance control on your home stereo system. Low Cut (for Ch. 1-4): This function cuts bass frequencies below 100Hz at a rate of 18dB per octave for channels 1, 2, 3, and 4. Instrument Switch: The instrument switch is used if you want to connect a guitar or other instrument-level source directly to the line inputs of channels 1 & 2. 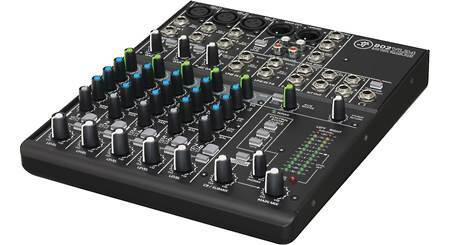 Searches related to the Mackie 1202-VLZ4 12-channel mixer.